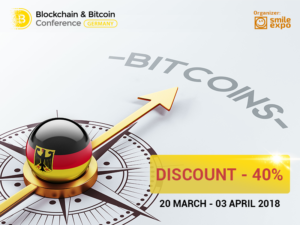 On April 4, a large-scale conference dedicated to blockchain technologies, cryptocurrencies, and ICOs, Blockchain & Bitcoin Conference Germany will kick off in Berlin. Conference speakers will include representatives of major transnational corporations, and the exhibition area will house well-known brands of the crypto industry including Trustier, Bubbletone, Unibright, APLA, which supply software and services for the crypto industry. At the event, attendees will learn more about the use of blockchain in business processes, regulation of cryptocurrencies and token sales, profitable investments in ICO projects, and building an efficient marketing strategy for ICO campaigns. – possibility to meet founders of leading startups, potential investors, and build new business partnerships. The event is organized by the international company Smile-Expo that hosts conferences dedicated to innovative technologies in different parts of the world.